We provide the latest technology and expertise in operating technology so that the client's message is heard loud and clear. We believe it is the details the client will not see that separate us from the rest, providing solutions to any corporate theater need you can imagine. We have proven solutions to any production need that may arise. We are committed to supplying our customers with the finest service in the industry. We support these goals with a corporate philosophy of adhering to the highest ethical conduct in all our business dealings, treatment of our employees, and social and environmental policies. TAVS has assisted many organizations and companies with audio visual production services for small to large conferences. We can assist you in the design and implementation with our trusted staff and expertise. We can provide you with technical support, high quality production equipment, and a reason to let go of all your audio visual worries! Let us know the time, date, location, room size, budget, and we can figure out the rest! What can be more important than lighting? We understand that your speakers, presenters, performers, actors, musicians, and entertainers all need to be seen by your audience! Let us take hold of the reigns by providing you a detailed outline of what should be available at your event. We take all things into consideration such as budget, room size, audience size, indoors, outdoors, and everything else! We offer Web casting services for your meeting or event. We will provide you with the necessary tools, equipment, and staff. We can put together a package for your specific needs. Wheather it is a small meeting or large event. Please email us your specific requirements and we will be able to assist you further. 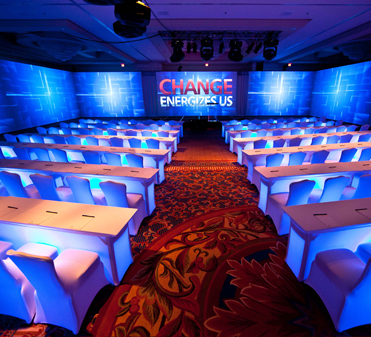 Many venues that offer conferencing and trade show services out-source their audio visual rental needs. We have the expertise, quality, and equipment to provide your hotel, banquet hall, meeting facility, conferencing center or private membership club with as much staff and equipment you need to service your customers. We understand the need for exclusive "in house" audio visual providers and rentals. We love providing outstanding on-site management services, technicians, maintenance, installation support and more! Feel free to get in touch with us to schedule a conference call or an on-site walk through of your facility, so you can see what TAVS can offer you! Planning a corporate event doesn’t have to be difficult or time-consuming. When you team up with TAVS, you get more than just a solution that meets your goals, timeline, and budget. We add value by providing creative, innovative solutions that bring your vision to life and make your message stick. From concept and planning to execution and follow-through, you can count on us to handle all of the details to make your next event a success. And should the unexpected happen, you can rest easy knowing that our extensive experience enables us to address problems quickly and efficiently. Focus on your message and leave the rest to us—we will exceed your expectations! Awards presentations are a way of honoring your clients and staff. With that in mind, presenting in a creative and unique way helps leave a lasting and exciting impression for your attendees. 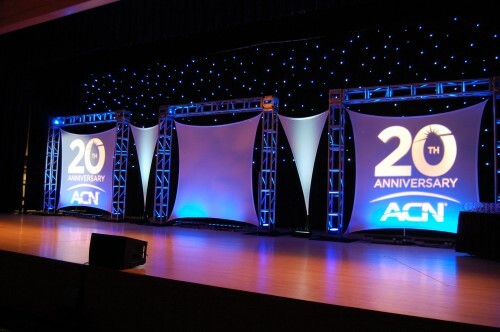 We uniquely utilize both sound and lighting to make these presentations stand out. Launching your product in a way you want to be seen by your target demographic is one of the most important decisions you will make. TAVS provides different environments, unique venues, and so much more to make an impact. Ask us how we can increase revenues with your upcoming product. Make your next party or special event unforgettable by team up with TAVS. Our creative and production teams will work with you to ensure that you spend your time having fun with your guests rather than worrying about the details. Whether it’s a large corporate party, intimate wedding reception, or anything in between, we have you covered.